It’s no secret that online reviews are important for all businesses these days, and that includes law firms. What may surprise you is just how important reviews are. Here at iLawyerMarketing we regularly conduct consumer testing in order to have a better understanding of how people choose lawyers online. Over the past 4 months, we conducted our latest study which involved over 300 participants from across the country, ages 21-65, 56% females and 44% males. Consumers were asked to answer 15 questions relating to the decision making process of hiring an attorney. While the whole study covered a variety of questions on why consumers choose one lawyer over another, a portion of our study looked specifically at how consumers used attorney reviews in their decision making process. What we found out is important information that every law firm should know going into 2018. What is the average review score a law firm needs to have before a consumer will hire them? 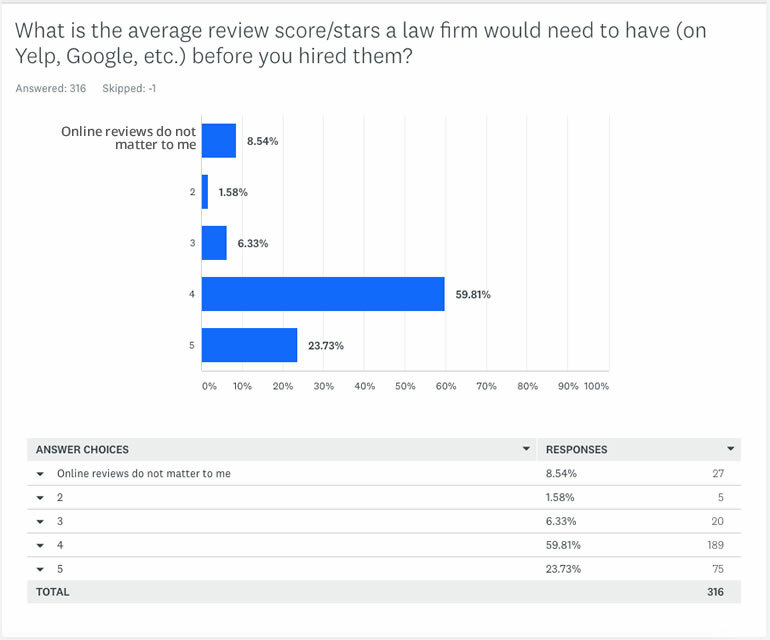 One of the questions each consumer was asked was, “What is the average review score/stars a law firm would need to have (on Yelp, Google, etc.) before you hired them?”. You can see the results in the image above, but 264 of the 316 respondents indicated a law firm needs to have a score of 4 or 5 stars. We knew reviews were a big deal, but this confirms just how important they are to consumers. 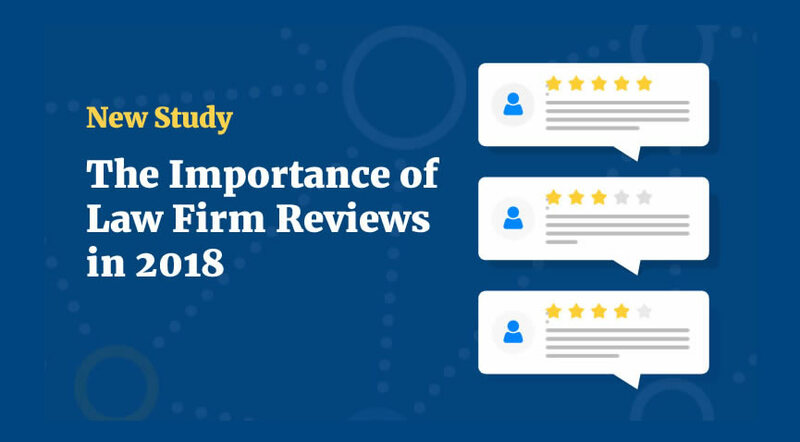 Nearly 84% of study participants said that a law firm would need to have review scores of 4 stars or higher before they would hire that firm. This means that if you don’t have at least a 4 star rating online, you are losing business to your competition. Even if you are referred to someone, poor reviews can cost you business. If your 3rd party reviews are not high enough, you need to work on getting better reviews in 2018. Additionally, pay attention to the reviews and to what people are saying about your business. If you do have negative reviews, don’t simply ignore them. At this point you know that angry clients (or even people just calling in to the firm) will leave bad reviews, so make every effort you can to make sure you are providing the very best service possible. And yes, I realize that there are crazy people out there who will leave unwarranted bad reviews but it’s something you will have to deal with. If you do receive a bad review, make sure you reply to it. Just keep in mind others people who are searching for your reviews online will see it, so be professional in your response. Overall ratings however are not the only thing that matters. The quantity of reviews you have also plays a big part in the consumer selection process. If you have 4 or 5 star ratings, but only a couple of reviews, for most consumers that’s not enough validation. Additionally, the number of reviews you have affects your CTR (click through rate) in Google’s search results. We often bring in survey participants for user testing studies so we find out as much as we can on how consumers go about choosing which lawyer to hire. Take a look at this video where some of our survey participants talk about how reviews impact their decision not only to hire a lawyer, but on where they will actually click on search results. Here in this image we see the #2 result received 68 clicks compared to 46 for the #1 result. Shouldn’t the #1 map result get more clicks than the #2 result? Not necessarily. Most web users scan a search results page and then click on certain elements on the page. One thing they specifically look at is review count and review score. In this case, the number of reviews (128 vs 38) resulted in more clicks. We asked “What review sites matter to you?”. 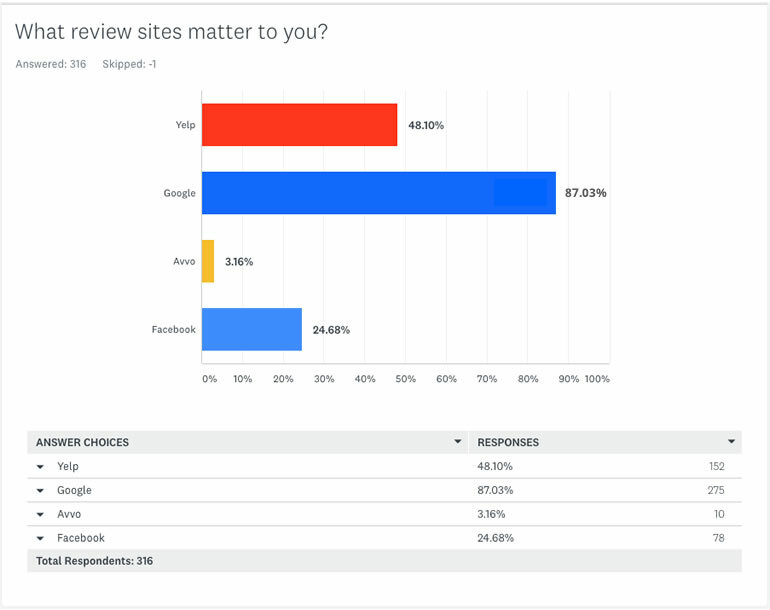 In our study, Google was the clear cut winner, with 87% of those surveyed saying that Google reviews mattered to them. No surprise either that Yelp reviews are also highly important, with almost half of all participants saying that Yelp reviews matter. Even Facebook reviews are important. As for Avvo? Just 3% of consumers said Avvo reviews matter to them. Many attorneys are proud of their Avvo ratings, but the reality is most consumers have no idea what Avvo even is. Yes, it’s well known in legal circles, but not outside of it. 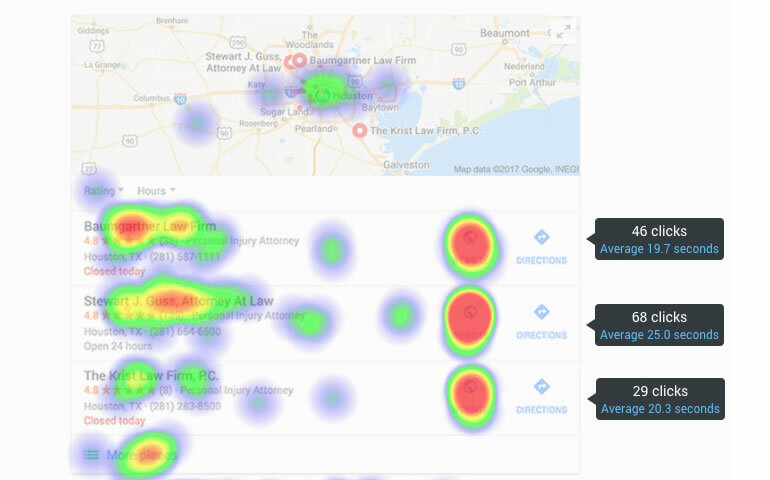 Still, your Avvo reviews may come up if people are searching for reviews of your law firm online so don’t ignore Avvo (or any other website where reviews of your law firm show up in search queries). Sign up for a service like Get Five Stars or Grade.us. In addition to helping you get new reviews, these services will also alert you when you get negative reviews. Note: Do not ask your employees to leave reviews or try to pay/incentivize for reviews. This is against Google’s terms of service, which states: “Reviews are most valuable when they are honest and unbiased. If you own or work at a place, please don’t review your own business or employer. Don’t offer or accept money, products, or services to write reviews for a business or to write negative reviews about a competitor. If you’re a business owner, don’t set up review stations or kiosks at your place of business just to ask for reviews written at your place of business.” Also, in case you were wondering, the FTC is not ok with offering incentives for reviews. Since we are on the topic, I need to mention something about fake reviews. Clearly, there are many law firms who have no shame and engage in fake reviews. Whether they do it themselves or hire other companies to do it, it’s wrong and unethical. As of now, Google does a terrible job of filtering out these reviews. Mike Blumenthal blogged about a review spam network he found earlier this year. I’ve spent quite a bit of time analyzing law firms reviews on Google and it’s usually fairly easy to tell which ones are fakes. I won’t go into the details as I don’t want to give ideas to spammers but I have to imagine Google will soon introduce improved methods to detect fake reviews and penalize those sites that engage in it. If you have an SEO company who is creating these for you, fire them because they obviously don’t care about your long term success. Going into 2018, reviews will continue to be an incredibly important part of the consumer decision making process. As one user tester pointed out in the video below, 3rd party reviews are much more credible than the reviews you place on your own site. Consumers know you are only going to place positive reviews and testimonials on your own website so they don’t raise the level of trust and validation like 3rd party review sites do. In closing, watch one more video on consumers talking about the importance of reviews on Google & Yelp. If you didn’t understand how important reviews are before, you do now. Note: Our next blog post will feature more insight from our latest consumer study, so be sure to check back soon or simply sign up to receive to our newsletter at the top of the sidebar.